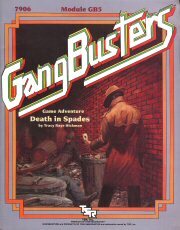 TSR -- seeking diversification from the fantasy genre -- introduced its Mafia & G-Men genre game in 1982. Like its contemporary brother RPG, Top Secret, GangBusters operated on a percentile-based rules system. It was a fine game and deserved more attention than it received. * 35"x22" double-sided full-color map of downtown Lakefront city showing detailed building interiors. * A mini-sheet of 70 die-cut counters. * 16-page introductory adventure ("Mad Dog" Johnny Drake, by Mark Acres) with Ward/Street map of Lakefront City as a cover. "Running for your life, you turn down the alley and freeze in your tracks. A dead end! Looking around, you see a window off the fire escape. A good leap could save you, but one slip would throw you right into the mob's hands. What started as a simple job has turned into a nightmare, with a dead man in your apartment and Nicky McCallister's goons breathing down your neck. You fling away the empty, useless gun and hear the mobsters charging down the street behind you. A bullet ricochets off the fire escape railing and screams into the night as you haul yourself onto the rusted metal platform. A long dive carries you crashing through the glass a heartbeat before the hoods below open fire. Safe for now, but where will you turn next? Where do you go when the mob owns the town and you're...a gangbuster? The roaring 20s: the age of gangsters, prohibition, Model Ts and the great depression. Bootleggers and crime syndicates controlled entire cities, while gangs and bank robbers roamed the country. A handful ofhonest police officers, federal agents and private investigators were dedicated to freeing the public from the crushing grip of crime. 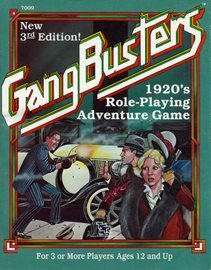 You can relive the adventures and exploits of these daring men and women with GANGBUSTERS™ 1920s role-playing adventure game. 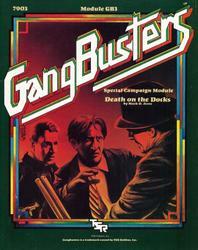 GANGBUSTERS role-playing game is different from most other games. Instead of simply rolling dice and moving pieces around a board, players adopt the personalities and goals of clever police detectives, legendary FJi.I. agents or vicious gangsters from the 1920s and 1930s. Players must face the problems and dangers of a life-and-death struggle against crime. Your decisions and fast action determine whether you win or lose, whether the criminals are arrested or escape, whether your game character becomes a hero or is gunned down in a blazing shootout." A 2nd edition was published in 1990 as a single perfect-bound book. It was incorrectly labeled as 3rd Edition. "3rd Edition" is a re-do of first edition rule book, incorporating background first presented in the modules Trouble Brewing and Murder in Harmony. The rules are basically unchanged. "Welcome back to the Roaring Twenties! Gangsters and crime syndicates keep whole cities under their control while notorious bank robbers spread terror across the country. This is the age of gangsters, Prohibition, and the Model T. This is the world of the flappers, bathtub gin, and the Charleston. 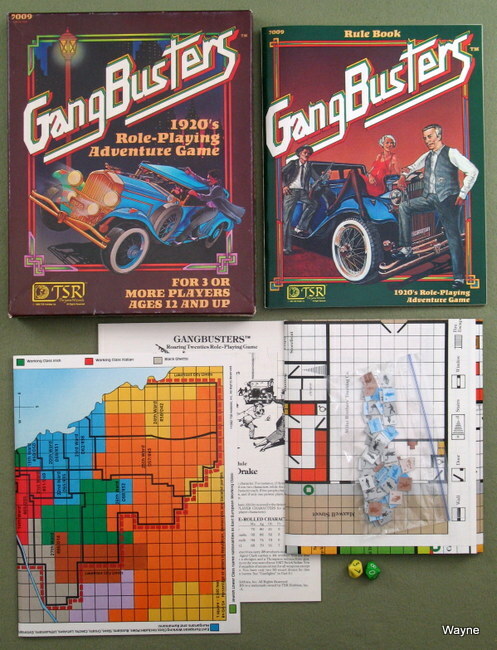 You can live those days of yesteryear with the GANGBUSTERS™ role-playing game! Walk in the shoes of a private eye, pound the beat as an honest cop in a dirty world, or enforce the law of the land as a Prohibition Agent. You can be a cub reporter, scooping the competition, or a gangland thug, terrorizing the honest citizens of Lakefront City. Adopt the roles of the famous criminals and crime fighters of the 20's and 30’s to face the struggles and problems of the crime-ridden syndicates of Lakefront City. 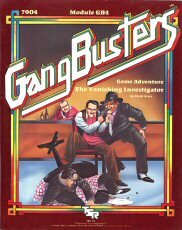 The GANGBUSTERS role-playing game has been thoroughly revised in its new third edition. Material has been separated for use by the players and the judges, and source material has been added for you to find more background information for your games. 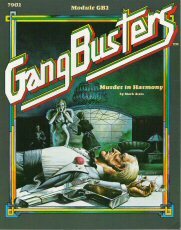 Everything you need for a GANGBUSTERS game is included in this one volume! You don't need any more than the book in your hands and two 10-sided dice to delve into the adventures of the Prohibition Era! • over 150 characters for use in Lakefront City, the official GANGBUSTERS campaign setting!" "This is the first in a series of modules for use with the GANGBUSTERS rules. TROUBLE BREWING is specially designed for the game judge who needs a background for a GANGBUSTERS campaign. Included here are details for the First Ward of Lakefront City, a series of ready-to-play adventures, over 150 non-player characters, and a special page of full-color car counters to use with the GANGBUSTERS street maps." When he was born, his wealthy parents decided he'd make a great son. They gave him every advantage. When he was a child, his teachers decided he'd make a great musician. They gave him a first class education. When he was grown, the sultry Betty Wilson decided he'd make a great husband. She gave him her hand in marriage. When he had married, his father decided he'd make a great heir. He gave him a fortune. When he sought a career, the Symphony Orchestra decided he'd make a great lead cellist. They gave him a job. When he grew older, the Musician's Union decided he'd make a great spokesman. They gave him their presidency. Then Arthur gave a cocktail party and one of the guests decided he'd make a great corpse. They gave him one last shot! Trotskyites and gangsters vie for control of the dockworker's union in Lakefront City. "The only thing not on strike on the Lakefront docks is Death..."
Comrades, when we take control of the union, I promise you those corrupt capitalist swine will pay in blood for their crimes! Gentlemen, trust me . . . once we control the Lakefront City docks we'll have this whole city by its throat. When these two groups clash, the only result is death ... Death on the Docks!" "For too long the city has suffered in the hands of crime and corruption: By fraud and forgery, by bootlegging and bribery, the syndicate has tightened its iron grip on the lives of decent citizens. But now the Senate Subcommittee is in town and a showdown is in the works..."
"The Oberklein Mansion was the scene of murder ten years ago. Now a supper club owned by Enrico Mancussi, it once again surfaces as the scene of foul play, the scene of death." "A game of crime and punishment! A role-playing game covering syndicates, police, federal agencies, criminal activities, police technology, criminal skills, weapons of all sorts, police techniques, profitability of crimes, corruption of officials, terrorists, police special units, hostage situations, laws, forensic sciences, the F.B.I. and its laboratories, SWAT teams, and inter-gang conflicts. Set in twentieth century America, the player characters are lawmen or criminals. Combat is highly realistic and lethal. 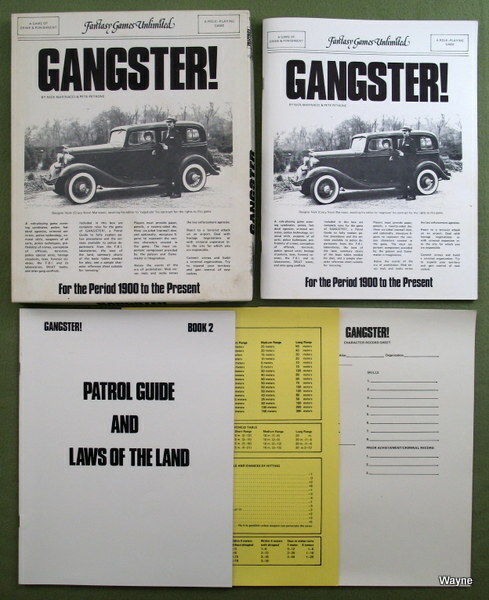 Gangster contains a 50 page rulebook, a 16 page patrol guidebook packed with background material, a cardstock character sheet, and a cardstock reference sheet. Relive the events of the era of prohibition. Mob versus mob and mobs versus the law enforcement agencies. React to a terrorist attack on an airport. Deal with hostage negotiations or with criminal expansion into the city for which you are responsible." 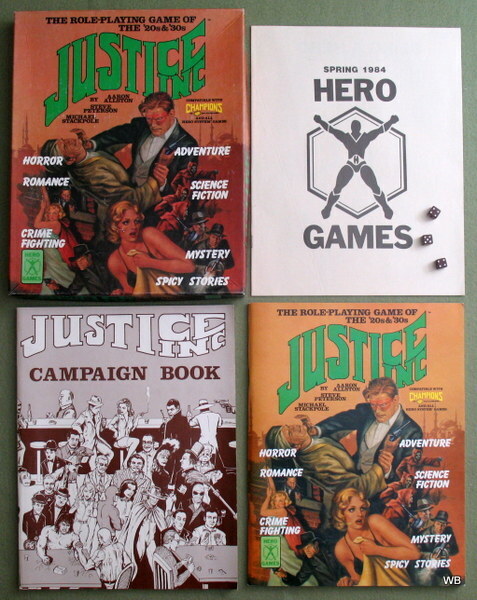 Justice Inc. contains a 96-page rulebook & an 80-page Campaign Book with adventures & background. Compatible with Champions and all Hero Systems games. "Become part of the Golden Age of adventure -- be the hero in a story you help create! Justice Inc. is designed to introduce the novice to role-playing games, but offers a challenge to even the most experienced game player." "The beautiful Beth Whitley tells a terrifying tale of danger at the Gold Spike mine. The sinister figure known only as the Condor has forced the closure of half of Whitley Mining through death threats and "unfortunate accidents." But why? What does this have to do with the legend of the lost gold mine or the mysterious pale men seen late at night? What is the Condor's deadly plot? Battle the insidious Condor from the bowels of the earth to the skies over Colorado! Can you end his reign of midnight terror and rescue the beauteous Beth from his clutches? 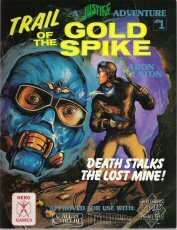 The Trail of the Gold Spike is an action-packed adventure for Justice Inc. which also includes conversions for Call of Cthulhu, Daredevils, and Mercenaries, Spies, and Private Eyes." First half of the book is a "how-to" manual on constructing lost worlds. 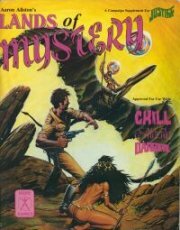 The second half of the book is a complete lost world campaign set in the alternate universe of Zorandar complete with player-characters, cave-people, Neanderthals, lost Romans, and dinosaurs. Compatible with Chill, Call of Cthulhu, and Daredevils.